With the introduction of the $99 Fire TV streaming media player, Amazon is no longer just a provider of streaming media content through its Instant Video and MP3 stores; the company now joins the ranks of Apple and Google as hardware providers within the space. There's no shortage of competitors in this very crowded genre, but Amazon hopes to distinguish its product offering with one key feature: voice search. You've probably seen the commercial with Gary Busey talking into the Fire TV's remote, searching for himself. We are promised that this little device will listen to us and find exactly what we say. Does the Fire TV deliver on that promise? 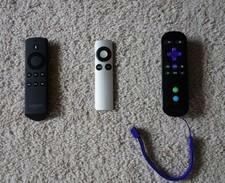 How does the rest of the experience compare with competitors like the AppleTV and Roku 3? Let's jump right in and find out. It seems that the designers of streaming media players take the phrase "little black box" quite literally, and the Fire TV is no different. A 4.5-inch square, the Fire TV has a slightly larger form than either the Apple TV or the Roku 3 (see photo to the right), but it's also shorter, at just 0.7 inches tall. The black-on-black color palette looks very similar to the AppleTV: a matte black finish with a glossy black logo on the top and glossy side panels. Back-panel connections are also the same, including one HDMI output, one optical digital audio output, a USB 2.0 port, and an RJ-45 jack for a wired (10/100) network connection. Dual-band/dual-antenna 802.11n WiFi is also built in. In comparison, the Roku 3 lacks the optical digital output that allows you to connect the box to non-HDMI-equipped AV receivers and soundbars. None of these three boxes contains an analog video output for connection to a legacy TV. The supplied remote, which communicates with the player via Bluetooth and doesn't require line of sight, shares the same color palette as the box, a matte black shell with raised, glossy black buttons. The remote's petite form factor should allow it to sit comfortably in just about anyone's hand, with the ability to easily reach all buttons with your thumb -- and it has that nice rubbery texture that makes it feel more secure in your hand. The button layout is simple and intuitive, with just nine buttons: home, return, info, play/pause, forward, reverse, a directional ring surrounding the enter/select button, and the all-important microphone button for voice search. The Amazon remote doesn't have the Wii-like motion sensing or headphone output of the Roku 3 remote. It also lacks a full keyboard. 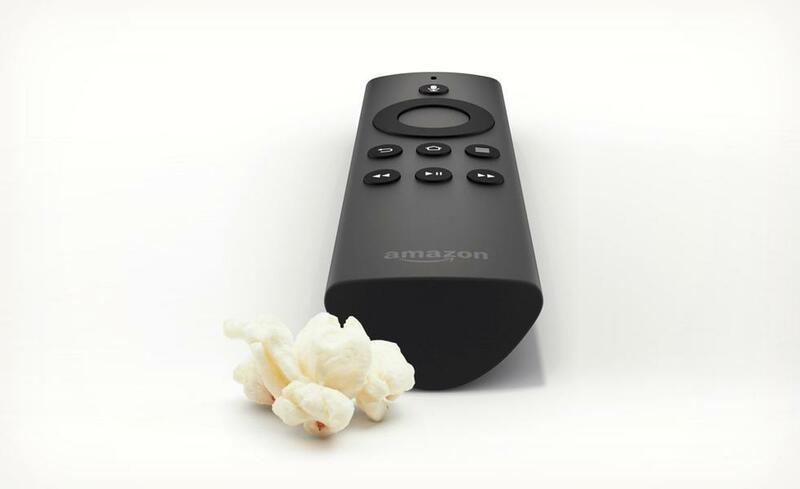 Unlike Roku and Apple, Amazon does not currently offer a free iOS or Android control app with a virtual keyboard to control the Fire TV, but a company rep says that this app is coming soon. The box does support second-screen control with the Kindle Fire HDX. Basic setup of the Amazon Fire TV could not be any easier. I began by connecting the player directly to my Panasonic TC-P55ST60 TV via HDMI; later, I routed it through one of the Harman/Kardon AVR 3700 receiver's HDMI inputs. The onscreen interface walks you through a series of setup steps: pairing the remote, making a network connection (I used WiFi), checking for and performing any needed firmware updates, and then playing a short video tutorial that clearly covers the basics. Lastly, you can choose to sign in to (or create) an Amazon account and/or sign up for a free 30-day trial of Amazon Prime. Interestingly, since I ordered the box directly through Amazon, my Fire TV was already linked to my account when it arrived; when I opted to begin a free trial of Prime, it instantly signed me up with no need to input any account info. Let's talk about Amazon Instant Video, for those who may never have used the service. It consists of two elements. The pay-per-use Instant Video Store is much like iTunes; you can buy or rent movies and TV shows, and you pay for each title that you watch. The price depends on the title and whether you get the SD or HD version. The Prime Instant Video service is Amazon's subscription offering, a competitor to Netflix that allows unlimited access to any content in the Prime library. Newer, big-name film releases and TV shows are available through the Instant Video Store far sooner than they are through the Prime catalog. While Netflix allows you to pay monthly and cancel at any time, Amazon Prime requires that you pay for a full year up front (after the 30-day free trial). Prime costs $99 per year, which averages out to $8.25 per month. Netflix currently costs $7.99 per month, but the company has announced plans to raise the monthly price by $1 or $2 for new customers. When that happens, Amazon Prime will be the slightly better deal, but again you have to commit more money upfront. Other perks of an Amazon Prime membership include free two-day shipping for anything you order through Amazon.com and one free book rental per month from the Kindle Store. You don't have to sign up for Prime to enjoy the Fire TV player, but it'll be a whole lot cooler if you do. Yes, the Fire TV includes big-name apps like Netflix, Hulu Plus, YouTube, and Pandora, but the voice search currently only finds content within Amazon's Instant Video service. So, if you don't sign up for Prime, you're limiting the catalog of searchable content. Amazon recently announced that it will add other services to the voice search very soon, including Hulu Plus, Crackle, and Showtime Anytime. I've also seen some reports that Netflix will be added before year's end, So, this feature will only grow more robust as time goes on. A few other setup notes: Video resolution is set to Auto by default; other options are 720p and 1080p at 50Hz or 60Hz. The player supports Dolby Digital Plus soundtracks, but the box is set by default to stereo output for immediate use directly with a TV; you'll want to change that setting if mating the box with an AV receiver. You can also enable a quiet mode for late-night listening, as well as a screen saver that uses preloaded photos or your own library stored on the Amazon Cloud Drive. Parental controls let you dictate whether or not to require a pin when purchasing content, to keep little ones from running up the bill. Click on over to Page 2 for the Performance, the Downside, Comparison and Competition, and the Conclusion . . .